Though Karl Krienke retired in 1997 after 44 years in the Seattle Pacific University classroom, he still seeks to turn over every stone in the cosmos in search of truth. “We are in the process of discovering a God far greater than we’ve ever envisioned before,” says the man with master’s degrees in physics, astronomy, and religion, and a doctorate in astronomy. The frontiers of space are among Karl Krienke’s ultimate passions. 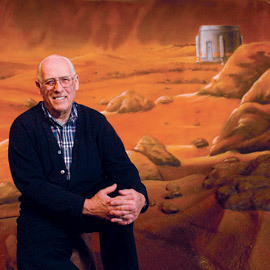 Behind him is a simulated Mars base camp at Seattle’s Pacific Science Center. To illustrate, he points to the wonders revealed by the Hubble Telescope. Through its mirrors, scientists last spring took a million-second-exposure to reveal 10,000 galaxies that are among the oldest ever seen. The image of the Hubble Ultra Deep Field will help scientists better understand how stars and galaxies formed in the early universe. It is the deepest portrait of the visible universe ever achieved. For more than 20 years, Krienke has been a member of the University of Washington research group headed by Paul Hodge, professor of astronomy and longtime editor of the Astronomical Journal. The two men have co-authored “Newly Identified Star Clusters in NGC 6822 and the Age Distribution of the Cluster System,” a paper that appeared in the June 2004 issue of Publications of the Astronomical Society of the Pacific. Krienke’s research included frames from Hubble imported to SPU via the Internet. Krienke also exchanges ideas with Christian astronomers, this year including George Coyne, director of the Vatican Observatory, and Owen Gingerich, professor of the history of astronomy at Harvard University. One of those things, he says, might be to devise a robotic solution to Hubble repairs that could prolong the telescope’s usefulness for many years — and discoveries — to come.